Russian Orthodox Church in Paris ? The Alexander Nevsky Cathedral was established and consecrated in 1861. Patriarchal Exarchate for Orthodox Parishes of Russian Tradition in Western Europe. 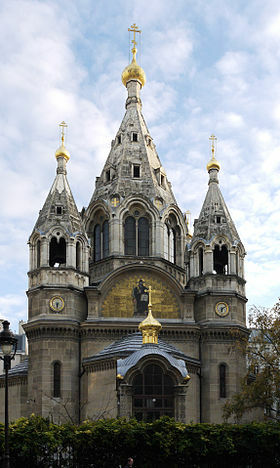 Many Russian aristocrats fled to France after the Russian Revolution, in 1917, Alexander Nevsky Cathedral was their church. Neo-Byzantine Novgorod-style of the 1600s, by the tsar’s architect Kouzmin. 12, rue Daru in Paris 8th.